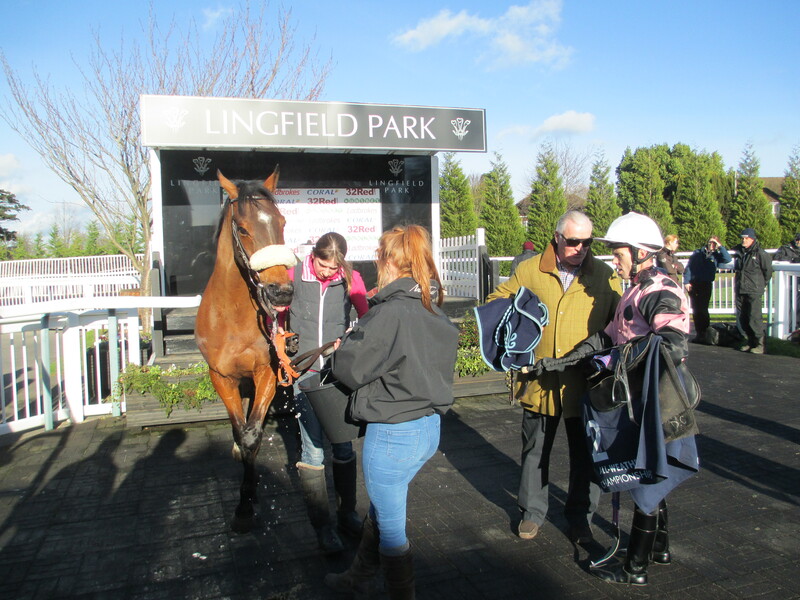 Trainer Don Cantillon (second right) is debriefed by jockey Graham Lee after La Estrella equalled Stand Guard’s record of 26 wins on the all-weather when landing the opening race at Lingfield. La Estrella posted a joint-record 26th victory on an all-weather surface when producing a typically tenacious display to win the opening race at Lingfield on Wednesday. The one and three quarter length success in the two mile Class 6 contest leaves the winner tied with the now retired Stand Guard for wins on a synthetic surface. The 12-year-old was sent straight to the front by jockey Graham Lee in the field of four runners in the 32Red On The App Store Claiming Stakes. He was joined by Investissement who challenged strongly in the run-in; but rose to the challenge and repelled his rival to secure a memorable victory. The win was La Estrella’s 28th in total – he has also won on the turf at Pontefract and over hurdles at Fakenham – and his trainer Don Cantillon’s main thoughts after the notable victory was that his stable star stays fit and well. “I work with him every day to keep him sound,” Cantillon said. “Tomorrow and the next day I will have to be keeping my fingers crossed and hoping that he is alright. “It is a privilege for my horse to have equalled the record of Stand Guard and I feel so sorry for them [Stand Guard’s owners] that their horse is no longer racing. “Graham [Lee – jockey] said that as soon as he had asked the horse to join him [Investisement] he said ‘yes’. He was dossing in front and all of a sudden he had a companion and had the inside berth and just won again. He is always the best at the end of his races. “We didn’t plan to make the running but we took the bull by the horns and it was a brilliant tactic by the jockey. “This horse every day is just like a boxer in a corner. He can’t wait to come out and that is the way he runs his races. He is an amazing horse. Please God he will be alright in the next 48 hours. “I have no plans whatsoever. But the way he feels and the way he is racing he will race again. Southwell is definitely his ultimate surface. He goes so much tougher in the home straight there. “It would be great [to break the record for all-weather wins at Southwell]. He has had 16 runs there and 15 wins. He is amazing around there. This is his 28th win because he has won a hurdle race as well.